COAL mining is set to replace 3,350 hectares (ha), and perhaps more, of reserve forests in Chandrapur district, Maharashtra. This will affect people who are dependent on such forests for everyday needs like firewood. The Centre has given mining leases to three companies, of which Adani Enterprises has got 1,600 ha for its opencast mining project in western Lohara village. Adani recently submitted an environmental impact assessment (eia) report for its 140-million-tonne project and is obtaining other clearances. Two local non-profits working on environment and wildlife examined the eia and alleged that it did not include the project's impact on the nearby Tadoba Andhari Tiger Reserve. The company's plans, they said, had divided Lohara, the only village that would be rehabilitated, and 11 others that don't find a mention in the eia. The non-profits--Green Planet Society and Eco Pro--listed several irregularities in the eia (see box Grey areas in EIA) and the public hearings on September 11 and November 4. On both occasions the hearings could not be completed because of altercations between project supporters and opponents. Pointing out the flaws in the eia, the president of Green Planet Society said Adani had underestimated the extent of deforestation. "Adani will require another 1,750 ha for related activities such as dumping, housing, roads, workshop and so on," said Suresh Chopane, the president of the non-profit. Adani has earmarked 600 ha for dumping, the company's general manager informed those present in one of the failed public hearings. "If this is true, why does the eia mention that the project has no space for the related activities?" asked Chopane. Taking into account the requirements of all three pending projects, the total amount of deforestation would be "to the tune of 10,000 ha", he added. The Adani project may also affect a 10-ha tank in Lohara, which sustains several natural water sources in neighbouring villages and within the Tadoba reserve. The tank is in the mining area of the project, said Durga Kamdi, also of Green Planet Society. She added that mining activities of Western Coalfields Limited had affected the groundwater table in villages close to mining sites. "The Adani project will intensify the water crisis." The groundwater table would be impacted only in a 1,078-metre circumference around the mining area, clarified Sanjeev Doke, general manager of Adani's Lohara project. There would be no "competing user" there as the Lohara village would be moved, he added. Water purification methods have not been addressed in depth either, said Kamdi. The eia talked about sedimentation tanks as the only method to purify water. "What about acid mine drainage?" she asked. "If the acidic water from the mines is released into the nearby Zarpat and Wardha rivers, as the eia proposed to do, it will damage the river ecology and impact farms that depend on the river for irrigation." Doke explained that since acid mine drainage was not prevalent in the area it was not included in the eia. Kamdi called it a "glib assumption" that acid mine drainage could be ruled out in the future. "With deforestation and continued mining activity, the parameters of the soil are bound to change," she said. The wildlife survey given in the eia left out 14 vital fauna categories. "The Tadoba reserve and its neighbouring forests are one of the best tiger habitats in the country. The fact that the survey did not cover mammals is not surprising. The mention of tigers would have made the project impossible because Tadoba was notified a critical tiger habitat in December 2007," said Bandu Dhotre of Eco Pro. On the omission of a wildlife management plan, Doke said that the information provided was preliminary and it was being prepared again. The Principal Chief Conservator of Forests (pccf) Wildlife, Maharashtra, should get the final report in a month's time, he said. 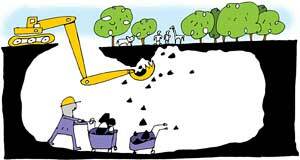 The eia had presented false information that the core zone of Tadoba was about 25 km from the mine site, Dhotre said. Maps of the region show that the mining site includes forest compartments of Tadoba's buffer zone, which were declared ecosensitive by the forest department. The buffer zone of the project overlaps some 100 compartments (20,000 ha) of forestland in the buffer zone of Tadoba and touches its core zone, he said. The mining area of the proposed project is 11 km from the boundary of Tadoba, confirmed Shesharao Patil, chief conservator of forests, Maharashtra. He added that mining would adversely impact it. Legally, land within a 10 km radius of the protected area should be regarded ecofragile, but "we are not in a position to push the issue aggressively because the buffer zone is not notified yet and is merely proposed". 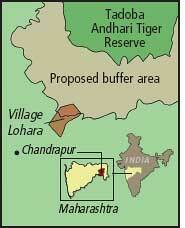 Patil has written to the pccf and reiterated that the project and Tadoba cannot coexist. Wildlife expert Poonam Dhanwate of wildlife group track in Nagpur, who was part of the survey team for the demarcation of Tadoba's buffer zone, also agreed that mining area of the project was a "fantastic wildlife base". People's response to the project is mixed. Residents of Lohara strongly support the project but demand that they be paid Rs 20 lakh per acre (0.4 ha) as compensation, against Adani's offer of Rs 2 lakh. Residents of 11 other villages who depend on wage work in the stretch of forest are against it. The eia makes no mention of these villages. But Doke later promised that Rs 40 lakh per year would be dedicated to "development activities in the village to bring down their dependence on forest". "We do not want development sops," said Manoj Khante, sarpanch of Ghantachowki village. "The dust from the opencast mine will destroy agricultural land and some 10,000 residents from 11 villages will lose wage work. We do not want the mine here, that is all." But, for Lohara villagers, money is the only lure. "Environmentalists dominated the public hearings," said resident Vinod Domaji Uike. "We want a village hearing with no one but villagers, the collector and Adani representatives." Lohara has seen a lot of easy money as 90 per cent of the village's agricultural land is leased out to three resorts and rich land-owners, said Y Y Doodhpazare of Green Planet Society. "People believe they will get lots of money out of rehabilitation but Adani's promises do not hold water." The village has been promised 1,600 jobs in the project, whereas the village's working population is around 650. The eia does not specify the nature of this employment, or the eligibility. The rehabilitation site has not even been decided and there is no mention of compensation. "Oustees from many other projects in the district are awaiting promised rehabilitation," Doodhpazare said. "Lohara will suffer the same fate. " But "we are not like the other oustees who lack negotiation skills. We will not leave till all our conditions are fulfilled," said Asif Malak, a Lohara resident. The village has the backing of local politicians. MP Hansraj Ahir and MLA Sudhir Mungantiwar, who had earlier opposed the project, have now softened their stand and want underground mining to "minimize environmental damage". But they told Down To Earth that power was the state's priority and they would not oppose mining, whether opencast or underground. Maharashtra has 20 per cent forest cover and the only dense forests are left in the two tribal districts of Chandrapur and Gadchiroli. The question that environmentalists are asking is can the state afford to lose 10,000 ha of it?